This is an updated version of a page from the first version of my website. It will be moved to the Pages section in a few days. For classification purposes, we can separate land conservation by government and land conservation by private organizations. Two models of private land conservation exist–land trusts and land advocacy organizations. Land trusts protect land by direct action. They buy it or accept it as a gift or acquire a partial interest called a conservation easement that allows them to protect the conservation values of the land. Land advocacy groups, on the other hand, protect land indirectly by persuading government to buy or set aside land for parks or preserves and to regulate privately held land in ways that prevent its degradation. The Nature Conservancy is an example of a land trust; the Sierra Club is an example of an advocacy organization. Land conservation by government has been important since the early years of the 20th century, beginning with Teddy Roosevelt. A few scattershot efforts, such as Yellowstone and Yosemite, occurred earlier. For 75 years or so, federal, state, and local governments did a fairly satisfactory job of land conservation. This progressive era came to a halt in 1981. Since that time, governmental land protection efforts have been weak or absent, occasionally rising to near adequacy in a few places for brief periods. The slack left in the vital task of land conservation has increasingly been taken up by land trusts. The first land trust was the Trustees of Reservations, formed in Massachusetts in 1891 through the efforts of Charles Eliot. Several more organizations that followed what we now recognize as the land trust model were begun in the next several decades. Examples include the Society for the Protection of New Hampshire Forests, formed in 1901, Save-the-Redwoods League (1917), Western Pennsylvania Conservancy (in 1932 as the Greater Pittsburgh Parks Association), and Michigan Nature Association (1951 as the St. Clair Metropolitan Beach Sanctuary Association). Nevertheless, the rate of land trust formation was slow, and fewer than 50 bona fide land trusts were in operation by the middle of the 20th century. Rapid growth began with the emergence of the popular environmental movement in the late 1950s-early 1960s. By 1980, more than 400 land trusts were in existence. Formation of new land trusts shifted into high gear in the 1980s as public-minded citizens became aware of two unhealthy trends: the near-abandonment of land protection by government and the escalating loss of natural and agricultural lands to sprawl. By 1990, there were nearly 900 land trusts in existence and by 2000, 1263. A renewed growth spurt took the number to 1667 in 2005 in the most recent complete census. It probably makes sense to think of the land trust “movement” beginning during a few months from the fall of 1981 to the spring of 1982. Even though about 430 organizations that we would now call land trusts were in operation by 1981, few had any information about what the others were doing. Most were probably unaware that so many other groups with similar aims existed. Two national meetings in 1981, one in Cambridge MA and one in San Francisco, helped to spread the word. The Cambridge meeting, in particular, led to the formation of the Land Trust Exchange, renamed Land Trust Alliance in 1990. These meetings and the activities of the LTE as a clearinghouse and umbrella organization helped to turn the separate local groups into a community. Today every state except North Dakota has at least one land trust. The density varies greatly. California has (as of 2005 by the Land Trust Alliance census) 198. Massachusetts has 161 and Connecticut, 128. The other states have numbers in the tens or–for much of the South, the Rocky Mountain region and the Plains region–in single digits. As for results, land trusts have protected about 11.9 million acres, as of 2005. Nearly half of these acres were protected in just the 5 years from 2000 to 2005. 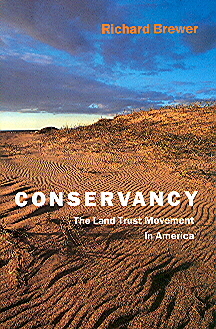 Much more about the history of the land trust movement, its connection with the broader conservation and environmental movements, current practices of land trusts, and prospects for the future are discussed in Conservancy: The Land Trust Movement in America. The website of the Land Trust Alliance is informative, as are its many publications including its journal Exchange. This entry was posted in Conservation, Land Trusts (& other private land conservation). Bookmark the permalink. Both comments and trackbacks are currently closed.